To reiterate a cliché, the rail journeys themselves become the destinations, rather than simply being peripatetic wagons. Thanks to JK Rowling's literary clairvoyance, Harry Potter and his ilk travel to and aboard fraction-numbered platforms (9 3/4) and mythical trains (Hogwarts Express) departing from London's mainline railway station, King's Cross, in order to reach the mythical wizarding village of Hogwarts. However, more than two decades before Rowling first spun her charm, Satyajit Ray had achieved nearly the same effect - if not a more pragmatic and credible act - in the film, Sonar Kella (1974).The film has been hailed by American critics as "an elaborate Hollywood production". Ray himself jocularly spoke about the train-chase sequence that he achieved using one camera, where "Kurosawa would be using nine". The film casts the Indian Railways as a character, in an unprecedented and intriguing mise en scène. Here modes of travel - railways, motor cars and human potential for meditative or "telepathic" time travel - are brought into a contest for a fixed geography, that of Jaisalmer (in Rajasthan), and its golden fortress. The meaning of "golden", however, has different connotations for each character. Also, each mode of travel unravels a unique geography and function of the place. The credit-sequence of the film concludes with a very memorable staccato musical composition. This sequence, which very closely resembles the sound of a train on the tracks, is executed by Ray entirely through brassware, earthenware or wooden tools of daily use, which double up here as musical instruments. Paradoxically, the clatter of the rails - which is typically a plainsong of industrial or postcolonial modernity - is produced through pre-modern implements. Later, a similar crescendo is built by a Rajasthani folk performer, at night, outside the Pokhran railway station, where the staccato notes are struck on small wooden bars. While at the circuit house in Jaipur, the sound of the hooting of distant engines is often carried by the clear desert wind, at night, as the trains assert themselves in the background. Most of the drama in the film unfolds on the railways, first on two separate trains, both bound to Jaipur, and later, on one travelling from Jodhpur to Pokhran, and another from Pokhran to Jaisalmer. The villains of the film, AM Barman and M Bose, are introduced to us only through their names on two reservation charts, hung on two concurrent express trains on the Calcutta Jodhpur line. Besides, there is the ominous railway clock (Gents Clock), shown to us twice at the Calcutta and Delhi railway stations, as a sign of something that is to be wound back and forth, and time ranging across colonial history, memories associated with the trains, or the pages of the Nature magazine, which Feluda references for William James Herschel's fingerprinting technique. The spotlight is on Mukul Dhar (the jatishwar or twice-born) who claims to have lived in a desert region in the vicinity of a golden fortress, in his previous life. His father, he says, dealt in gemstones. Newspaper coverage of Mukul's story reaches the two conmen (Barman and Bose). Meanwhile, a well-known parapsychologist (Dr Hemango Hajra) volunteers to take Mukul on a journey to Rajasthan to find the fortress the child sees in his visions, and then tries to replicate in his crayon-sketches. The conmen follow, and are in turn followed by Pradosh C Mitter (Feluda), the private investigator, and his nephew and aide, Topshe. The Sonar Kella (Golden Fortress) itself is the vehicular trope that becomes the tour de force - the transcendental stratagem - behind the several journeys on long-distance trains. Two sets of journeys intersect on the trains. First is the train of the Calcutta-conmen, seeking the hidden treasure. It is the same as the one on which Mukul and Dr Hajra (the parapsychologist) are on, bound for Jaipur. Second is Feluda and Topshe's meeting with the writer Lalmohun Ganguly (Jatayu), in Kanpur, who then becomes their companion for the rest of the adventure. Both the journeys unfold in first-class compartments, and are replete with instances of how consumption of food becomes an assertion of Bengali nobility in passage. 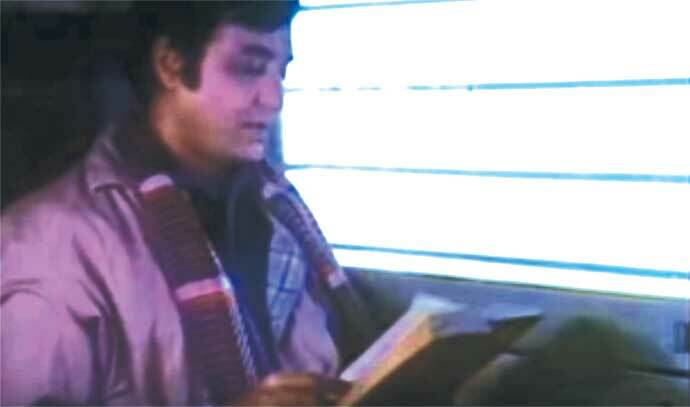 "Eat the sweets, Topshe," Feluda says, "the train is running late, Kanpur is delayed, and so is breakfast." Breakfast comprises bread and omelettes, eaten typically, but uncomfortably, with a fork, aboard a fast-moving train. The intersections display the potential of the Indian Railways in hosting accidental or staged meetings with celebrities, like-minded intellectuals, villains, thugs, and businessmen, therefore the diversity of India in the mobile microcosm. Ganguly is the typical dialectician - in the ironic sense that I use the word here - who represents a microcosmic cosmopolitan Bengal-in-transit. For his dialectic (argument) on geographical facts, landscapes, camels' water-preservation mechanism, instruments of self-protection ("atma-raksha-bal" as he calls his Nepalese dagger), narrative plots, or the physiognomy of his detective fiction's character (Prakhar Rudra), are all comically flawed. These flaws are not annoying but amusing as Ganguly lends himself to be caricatured - along with his imported red "Japani suitcase" - as an avuncular character in a children's railway story, or a modern railway-raconteur superimposing imagined landscapes on the real ones. The most remarkable intersection of journeys happens in the final chase sequence where three separate time-zones appear to transect, upon the "patbhumika" (Ganguly's lexicon for "setting") of the Thar desert. Having twice been outsmarted by Barman and had their car tyres punctured twice, Feluda, Topshe, and Ganguly take to a more primitive, pre-railways mode of travelling - the banjara camels. Meanwhile, Bose leaves Jodhpur in a car. 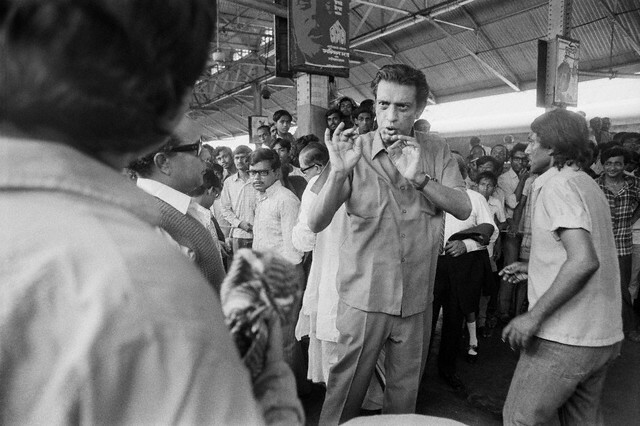 Barman, posturing as Dr Hajra, travels with Mukul, on a train. The conmen plan to reach Pokhran separately, and from there travel to Jaisalmer, with Mukul. 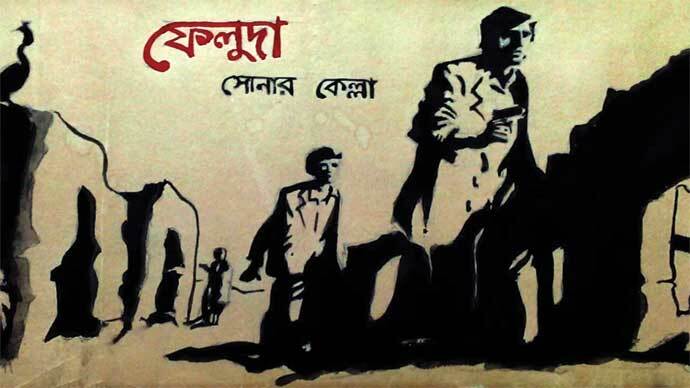 Bose's job is to obstruct Feluda and his compatriots. As a consequence, the railways come to be the background of one of the most staggering time-zone-overlaps in Indian cinema. Eight miles from Ramdeora, Feluda and his aides take the camels. The train on which Mukul is bound becomes a putative locomotive of time-travel, for it would apparently take him to the Sonar Kella he had lost in his previous life. With Sonar Kella, Ray propagates his profound adage: 'Whether or not there is previous life, there is no hidden treasure.' Photo: Ray SocietyBose, travelling in a car, defines the modern-day traveller who chooses road-transport over train-travel owing to the shorter duration of journey the former often affords. On the other end of the spectrum of time-travel-zones are Feluda, Topshe, and Ganguly, who are the voices of reason, progress, scientific temperament, and imaginative geographies - an assorted world of the future. Ironically, the camels they take are vehicles of a pre-colonial past. In one sequence, when the camels are chasing the train, Mukul is able to spot Feluda from the window, and Barman's ploy is almost foiled. The train does not stop. It beats the camels in the race towards a pristine and mirage-like past. But, in Ray's iconic use of natural colours in the film the colour of the infertile desert, mitigated by that of camel skins, comes alive with the approaching train - dull red and ochre - propelling fountains of thick steam-gauzes towards the sky. Earlier, at the Pokhran railway station, Ray uses natural colours to show the setting sun, against which the foreground unfolds with silhouettes of Rajasthani men wearing heavy shawls that form an integral part of the local ancillary industry connected with the railways. The train that Feluda and his aides take from Pokhran to Jaisalmer, has the words "FORT OF JAISALMER", boldly inscribed establishing the train itself as a quasi-fortress, manned by Feluda. Indeed, the real fort does not exist, or does so only as a poetic misnomer, and certainly is not made of gold but of yellow limestone. Likewise, Mukul's visions of hidden treasure do not lead to any tangible wealth, but an exorcism of the hauntology of feudal and imperial wars in Rajasthan. In many ways, to reiterate a cliché, the train journeys themselves become the destinations, rather than simply being peripatetic wagons. In them we seek a domicile, as we do in the Jodhpur circuit house, where Feluda and Topshe temporarily abide. The trains signify thrill, adventure, tourism, and most importantly the power of steam - its civilising power and power to preside over the justiciable. As the "FORT OF JAISALMER" is about to halt, Feluda points out to his nephew, the transient and transcendental golden fortress: Look over Topshe... Sonar Kella!" Through this depiction of a camel-chase-train society, Ray propagates his profound adage: "Whether or not there is previous life, there is no hidden treasure." Meanwhile, the narrative is embedded with shadowy scenes such as the one at Pokhran station - a night-train approaching the platform from behind a solitary oil-lit lamppost. The allure of trains adds to the pastiche of the archetypal treasure-island-fallacy. What was primarily made as a children's film turns universal and also serves as a tourist brochure. Author, 'The Purveyors of Destiny: A Cultural Biography of the Indian Railways,' Founder Editor-in-Chief, Coldnoon (International Journal of Travel Writing & Travelling Cultures), Assistant Professor, English Jindal Global Law School, O.P. Jindal Global University.